Parents / Carers / Guardians are ideal candidates for the role of support person, and can continue to support the child after the program has been completed, by reviewing key strategies and progress with the child. The support person will be provided with tip sheets to help support their child, with strategies and activities to complement the program outside of school. Such activities are not time or labour intensive and help children to take control of their own behaviour. 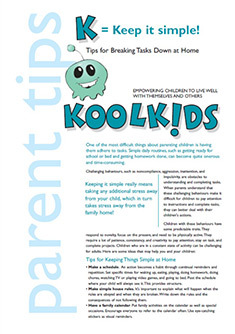 The parent tip sheets have been developed around the 'KIDS' acronym. The support person is asked to attend a final review and celebration of their child completing the program. The support person will take a secondary role during the program; however, he/she will provide regular encouragement and support to the child.